In the previous Sexi Brexi post we saw how Stockport coped with their return to the Championship after four consecutive promotions. To read about the first half of the season, check out the post by clicking the link in the image below! Going into the last game the threat of relegation straight back to League One is looming. Stockport face 14th placed Preston at home while Wigan play 12th place Aston Villa at home as well. In the 17th minute Tommy Wright hit the bar and Aston Villa took the lead in the other game. Stockport were looking solid and the ghost of relegation felt at a safe distance. However, in the 32nd minute Wigan equalised against Villa and in the 40th minute Preston took the lead the lead against Stockport. This would see Stockport relegated on goal difference. Early in the 2nd half Preston made it 2-0, but Stockport scored just 2 minutes later making it 2-1. In the 68th minute Kirby timely scored his first goal of the season making it 2-2. A goal by club legend Frank Mulhern to make it 3-2 allowed Allbäck and Angry Tony Pulis to finally breathe again. A 95th-minute equaliser from Preston couldn’t change the fact that Stockport once again had managed to achieve the impossible! Wigan held on to a draw which meant that had we lost we would have been relegated. This time it wasn’t a promotion, but a well-deserved push to remain in the division, giving the team a foundation to build upon for next season! With his tactical endeavours being far from anything to cheer about this season, at least Angry Tony Pulis was satisfied with the fact that the players had displayed “heart and character, a true love for the tough game of football”. 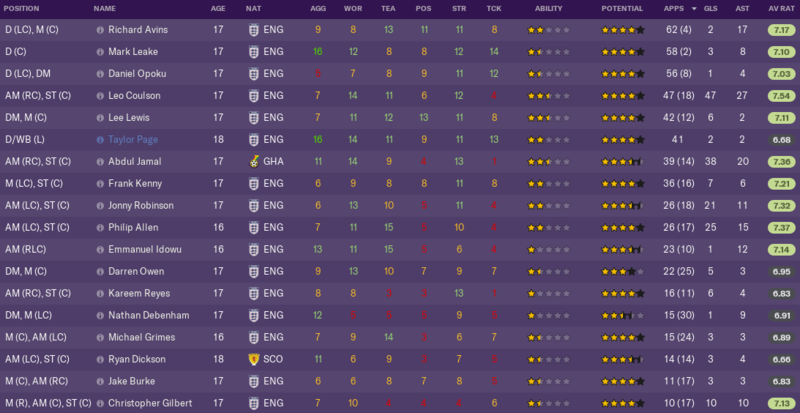 Last season Marcus Allbäck and Angry Tony Pulis created their own youth intake for the first time, which has proven to be a complete and utter success! At the time of this season’s intake three players had already been promoted from last years U18s. Daniel Gibson has shown the most improvement and is beginning to become a steady starter, while both Rooney and Potts have gotten a couple of chances off the bench at least. The new intake saw two players from Stockport claim a spot in the squad. Midfielder Dylan O’Neill and defender Freddie Thomas are both 4.5 star potential players, but with 1 and 1.5 stars current ability they are a long way away from first team football at the moment. The U18s had a great season, winning the regional league by quite a margin! 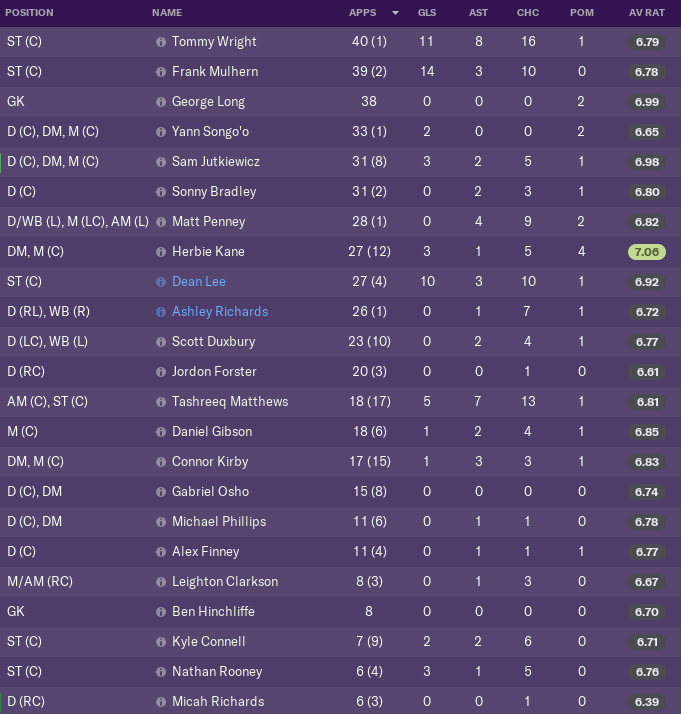 The squad is filled with talent as you can see below, which will hopefully mean a steady stream of players breaking into the first team in the next few seasons! Former England international Micah Richards decided to retire at the end of the season. As Stockport climbed the leagues he got less and less game time. In the Championship he was the 6th choice as central defender which made the decision pretty easy. That means that the team says goodbye to their only player with international experience on a senior level. However, youngster Daniel Gibson has played quite a few games for the Northern Irish U21s, making him a likely candidate to be our next international! Just like every season before this one attacking duo Wright and Mulhern proved to be two of the most important players of the team with 25 goals and 11 assists between. However, compared to previous seasons this tally was far lower than before, probably because of the tougher opposition in the Championship. 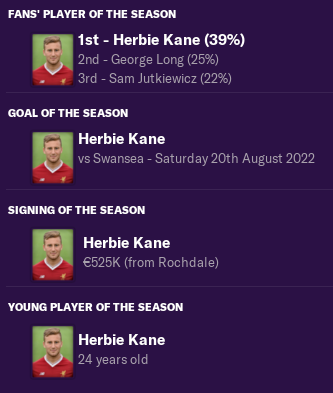 New signing Herbie Kane was the brightest shining star of the season with an average rating of 7.06. He also won a grand slam at the end of season awards ceremony! For the first time at the end of a season, the finances are in the red, meaning that the team is most likely in for another tough season considering that there will be no money for new signings. Clearly the squad this season was barely good enough for Championship football, making the team likely candidates for another relegation struggle. Hopefully a few of the youngsters can step up and make a difference for the team! I’m one of the guys participating in NewgenFM’s Achievement Hunter Challenge. I just finished my third achievement by finishing my fifth straight season at the same club. I’m still miles behind the guys in the top and really need to speed up my achievement hunting! This entry was posted in Achievement Hunter Challenge | @MikaelinhoFM, FM19 Stories, Football Manager 2019 and tagged achievement hunter challenge, england, fm stories, fm19, football manager, sexi brexi, stockport. Bookmark the permalink.